The report covers forecast and analysis for the infrared detectors market on a global and regional level. The study provides historic data of 2015-2017 along with a forecast from 2018 to 2024 based on revenue (USD Million). The study includes drivers and restraints for the infrared detectors market along with the impact they have on the demand over the forecast period. Additionally, the report includes the study of opportunities available in the infrared detectors market on a global level. The report provides a transparent outlook on the infrared detectors market. We have included a detailed competitive scenario and portfolio of leading vendors operative in infrared detectors market. To understand the competitive landscape in the infrared detectors market, an analysis of Porter’s Five Forces model for the infrared detectors market has also been included. The study encompasses a market attractiveness analysis, wherein type, technology, wavelength, end users, and regional segments are benchmarked based on their general attractiveness, market size, and their growth rate. The study provides a crucial view of the infrared detectors by segmenting the market based on type, technology, wavelength, end users, and regions. All the product, technology, end users segments of infrared detectors market have been analyzed based on present and future trends and the market is estimated from 2018 to 2024. Based on the type, global infrared detectors market is bifurcated into pyroelectric, thermopile, mercury cadmium telluride (MCT), indium gallium arsenide (InGaAs), micro-bolometer and others (PBS & PBSE). Wavelength segment of infrared detectors includes shortwave infrared (SWIR), long wave infrared (LWIR) and mid-wave infrared (MWIR) detectors. Technology segment categorized into cooled IR detector technology and uncooled IR detector technology. Automotive, consumer electronics, medical, military, security, and others are the key end users of infrared detector market. 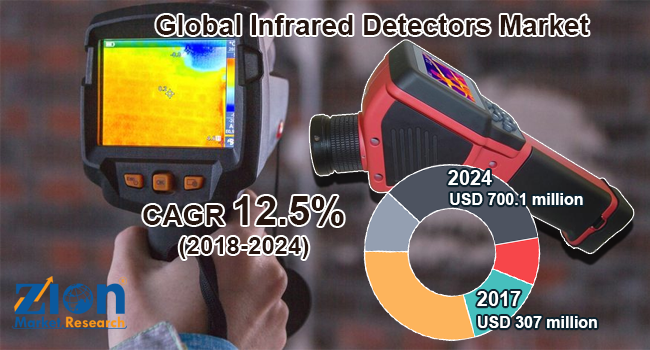 The regional segmentation comprises the current and forecast demand for Europe, Asia Pacific, North America, Latin America, and the Middle East & Africa with its further divided into the U.S., France, Germany, the UK, China, India, Japan and Brazil for infrared detectors market for infrared detectors market. The competitive profiling of key operating companies of infrared detectors market includes company and financial overview, business strategies adopted by them, their recent developments and product offered by them which can help in assessing competition in the infrared detectors market. Prominent players in the infrared detector market include Hamamatsu Photonics KK, Raytheon Co., ULIS, Texas Instruments Inc., FLIR Systems Inc., Melexis NV, Omron Corporation Murata Manufacturing Co. Ltd., Excelitas Technologies Corp., and Vigo System S.A. among others.